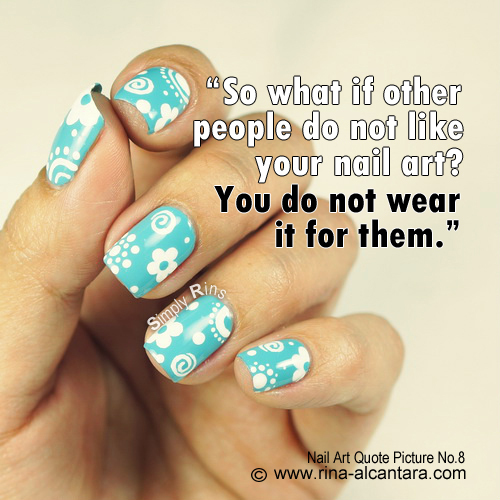 "So what if other people do not like your nail art? You do not wear it for them." Nail art used in photo is Little Things. Yes, yes! I find myself wearing a particular nail art longer if I am very happy with it. Sometimes, it only lasts a day when I am not satisfied with the design. I agree!!! And this flower pattern is super cute! Right on! Life is short to even worry about negative comments, right? You're absolutely correct. That being said, this nail art is really cute! Exactly - what I wear on my nails is supposed to make me happy, and luckily my husband likes 99% of what I do too! Very true! I always wonder too but it's indeed yourself you have to please.